A very well presented two double bedroom semi-detached bungalow occupying a corner plot within a popular location, opposite fields and with views of the South Downs National Park. The property is situated within walking distance of the local shops, schools and mainline railway station. An entrance porch leads into a hall which has a hatch to the part boarded and insulated loft space with ladder, airing cupboard housing consumer units and hot water tank. Doors provide access to all rooms and accommodation includes a 15'8 x 12'0 bay fronted sitting room with additional feature window, fitted kitchen with space and plumbing for washing machine, space for fridge and freezer, 'Leisure' range style 4-ring electric cooker with double ovens and grill, gas fired 'Greenstar Worcester' boiler fitted in 2012, opening through to the uPVC double glazed conservatory with double doors leading to the rear garden. There are two double bedrooms, the master being dual aspect with double doors to the garden and a range of wardrobes. To finish there is a bathroom fitted with a champagne colour suite to include an over the bath 'Triton' electric shower. Outside, to the front is a wide garden being mainly laid to lawn with flower and shrub borders, a substantial tarmaccadum hardstanding providing parking for several vehicles or space to store a caravan and a shared driveway leading to a detached garage having power and light. The low maintenance, fully enclosed West facing rear garden measures approximately 45' and is arranged as a coloured stone patio with borders with a further circular stone patio and timber shed. Additional benefits include gas central heating and uPVC double glazing throughout. A very well presented two double bedroom semi-detached bungalow updated and enlarged with a uPVC double glazed conservatory and a lovely re-fitted bathroom occupying a corner plot with wide front garden and tarmaccadum hardstanding providing parking for several vehicles and ideal for caravan, storage etc. Benefits include gas central heating to radiators, uPVC gutters and soffits and a low maintenance paved South West facing rear garden. In brief the accommodation comprises, an entrance porch leads into the hall where access can be gained to all rooms. 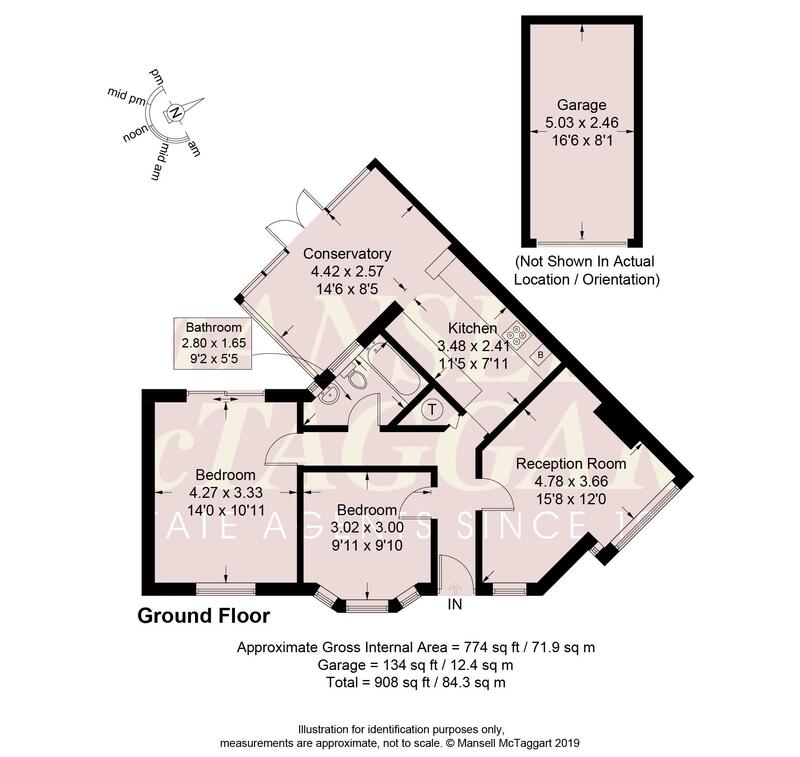 There is a bay fronted 17’2 x 12’6 sitting room, a kitchen which inturn leads through to the uPVC double glazed conservatory which the present owners use as a dining room. The master bedroom is double aspect and enjoys double doors onto the rear garden. The second bedroom has a bay window and there is a lovely re-fitted white bathroom/wc. Outside, there is a shared driveway leading to the detached garage, a fully enclosed South West facing rear garden, ample parking and a pleasant lawned garden to the front. Whilst in a village location this property is within one mile of all the amenities. From our offices in Hassocks village proceed along the Keymer Road heading eastwards toward Keymer village. Ockley Lane can be found on your left hand side before a small parade of shops, the property can then be found on the left hand side. Many bungalows of this style have been enlarged/extended into the substantial loft spaces and as such offer excellent potential, subject to obtaining the necessary consents.